Young people introducing new places and business ideas. 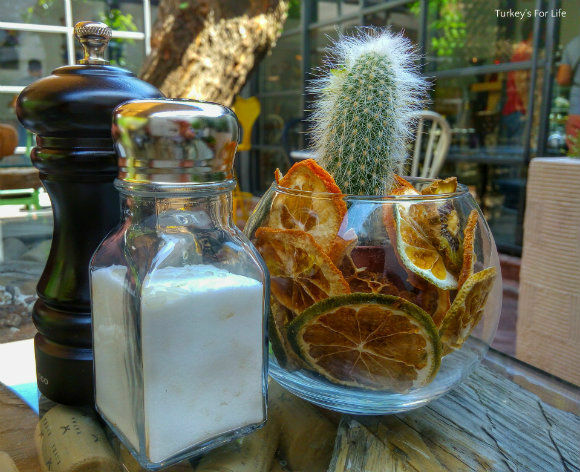 That’s what we really love to see in Fethiye – and Kukina Caferia is one of those ideas. A couple of years ago, the beginning of this story would have a been slightly more difficult – trying to explain to you where Kukina Caferia actually is in Fethiye. Kukina is on Çarşı 95 Sokak, you see, and not too many people know where that is off the top of their heads. Not difficult to see where that nickname comes from, is it, eh? Anyway, so we’re at the top end of 95 Sokak, not so far away from the fish market, and we’re taking you to Kukina Caferia; a new cafe bar and speciality coffee place that is fast building a loyal following amongst those in the know. If you look at the photo, there’s Kukina; that narrow doorway just to the right with the two fir trees at the entrance. 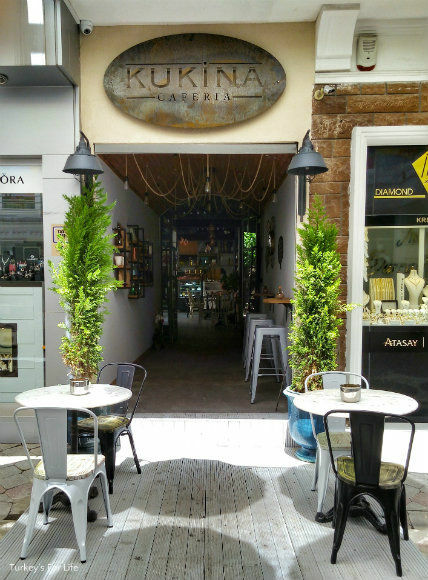 We say, ‘those in the know,’ because Kukina Caferia is a new kid on the block and we only learned of its existence because some of our Turkish friends on Swarm started to check in there and post photos. Would you venture down this pathway to Kukina? Hmm, you know that feeling when you start to think you ought to go somewhere lest you’re really missing out? Where you’re thinking you’re already late to the party? Yeah, we’d been pondering going for a little nosey and now it had become a necessary nosey… And then ‘necessary nosey’ became a bit of a regular we’re-in-town-stop-off and, since that first visit, we’ve eaten and taken Barry’s mum there, too – she’s good for opinions in either direction. Because we’ve taken you through the entrance so far – and now, here we are, in the actual cafe bar. Inside is air-conditioned, and, to our left (that you can’t see in the photo) is the coffee bar. Coffee lovers, this is a sight to love and appreciate in itself. As we said though, we’re going with the flow, and, over our few visits, we are yet to photograph one of the Kukina Caferia showpieces; guess we don’t order a lot of coffee. There’s also great desserts and cold meats displays here, too. Well, if we photograph everything, there’ll be nothing left for your own curiosity. You can go to see for yourself, this little coffee bar. Make sure you look up at the lighting, too. Great lighting everywhere in Kukina but you get cute little upended cups and saucers in the coffee area. 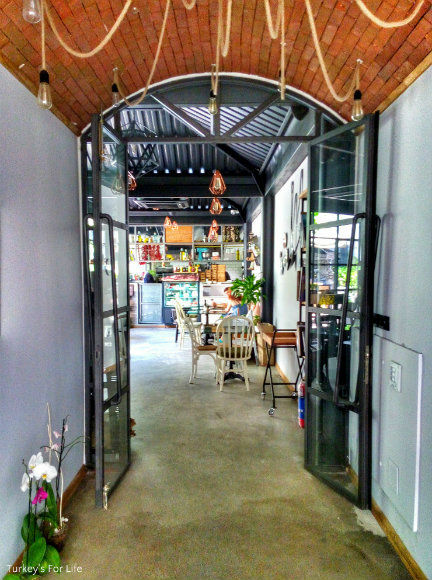 Straight ahead, as you walk in, is the open kitchen, complete with stone oven (taş fırın) and then, you can walk through and into the garden area. This is where we, and most other people, always sit – and, if you’re a sucker for a visible kitchen, you can still see the kitchen area via a pretty hatch lined with olive oil bottles, from this garden, too. 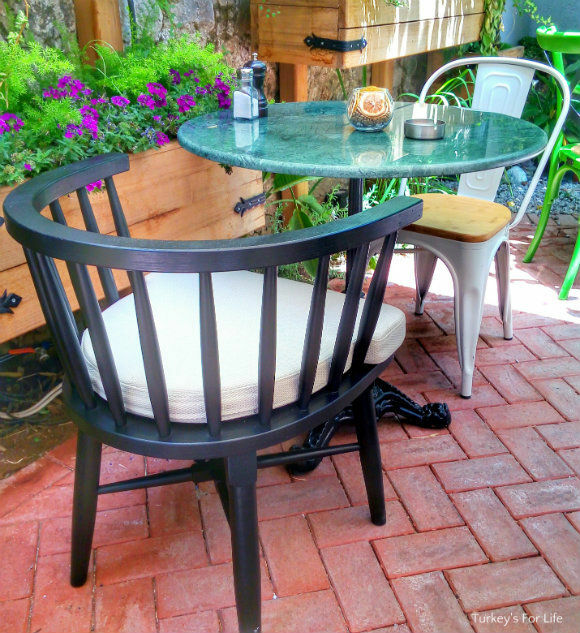 We love this garden area at Kukina. 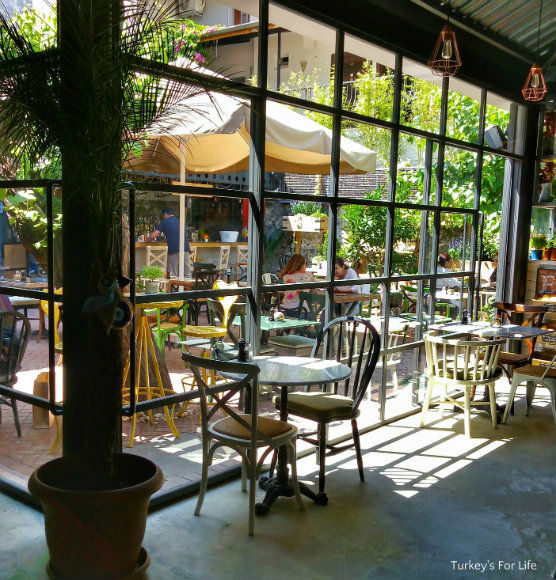 There’s a kind of urban – as well as Mediterranean – feel to it…and, once you’ve walked down that little alleyway from the street, it no longer feels like you’re in Fethiye. It’s a little enclosed hideaway of cobbles, mixed furnishings of marble-topped tables, wooden tables, glass-topped tables and a mishmash of chairs. It’s quite a small space but it all works really well – well, we think so, anyway. The surrounding buildings that create the enclosed garden space wouldn’t make for such a pretty backdrop but garden boxes filled with colourful flowering plants, bougainvillea and tall, rustling bamboo trees change all that. Add to that the huge mature trees in the garden itself and it all makes for a very pleasant place to enjoy a drink and some foodie treats. Yeah, so what about the food? Well, it’s quite an interesting menu they have at Kukina. A few tried and tested old favourites that you see in many Fethiye restaurants and bars – but also some more interesting dishes, too. We’ve eaten there twice now and, both times, it’s been really good. You’re given three menus to look at when you sit down: One for drinks from the bar (with an interesting cocktail list if that’s your thing), one for all of those speciality coffees of the hot, cold, iced, frappe, milkshakey-type variety and then your food menu. And whatever food you order, this is where the stone oven comes in. 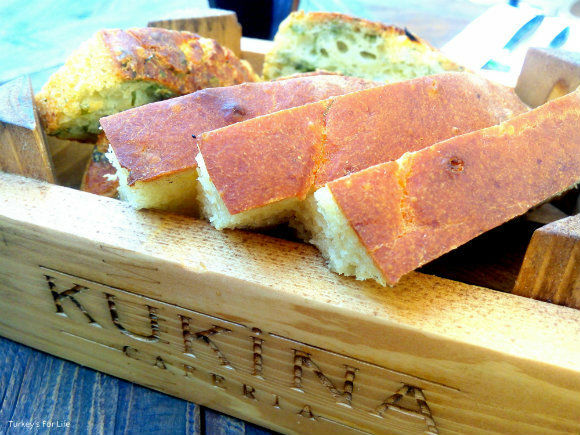 Kukina Caferia make their own bread – a traditional bread that’s baked in the stone oven. You will be served some of this with an olive oil dip. Sometimes, it’s just a plain homemade bread and other times…well it’s a little treat in store. A warm, fresh herby bread that also contains potato and onion! Wow, it’s good. Heavy? Yeah, a bit! But you just can’t leave it alone. Dipped in the olive oil… make sure to remind yourself that you’ve got a meal or a snack coming. Since living in Turkey, many is the time we’ve had a side salad of some variety with our meal – it’s just what you do here – but actually ordering a salad as a meal; that’s very rare for me. In fact, I can only think of one time, previously. We eat so much salad and meze at home, I just always choose alternatives when eating out in Fethiye. But after watching a few salads leave the kitchen and be delivered to their tables, and after spotting a steak salad with roasted vegetables on the menu – well, get me; I ordered a salad. Don’t forget, we’re going with the flow with photos in this post. 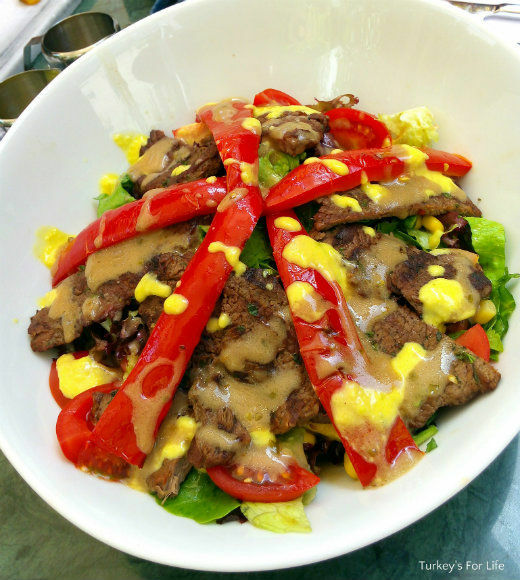 The steak salad you are now looking at was delivered beautifully dressed and presented and you get two extra dressings in separate jugs, too. I’d poured both dressings all over the top before I remembered to take a photo. Barry ordered the köfte because he saw somewhere in the description on the menu that liver was mentioned. Mmm, well this is what arrived at our table. 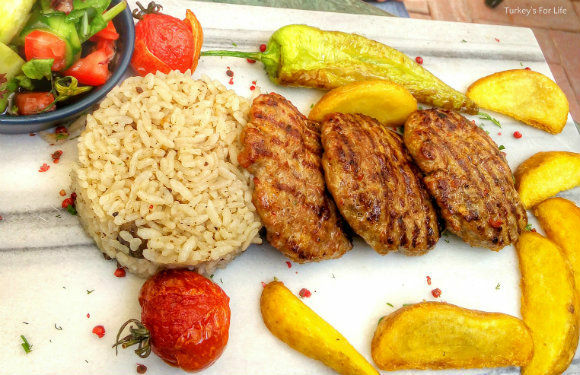 A hot marble tablet containing three large (these things are more like medium-sized burgers than köfte), juicy köfte served with potato wedges and Kukina’s special rice. This isn’t your traditional Turkish rice but a rice pilaf containing small chunks of liver. If you’re a liver fan, you’ll love this and it can be ordered as a side dish to other meals, too, if you don’t fancy köfte. Stone oven time again. As well as their homemade breads (which you can also buy to take away, if you like), Kukina Caferia also have pizza on their menu – and, these too, are homemade and cooked in the stone oven. 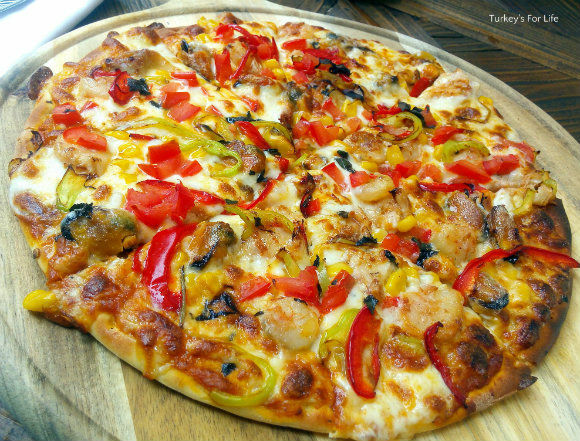 The second time we ate at Kukina, I ordered the seafood pizza and remembered to take a photo of it before I drowned it in Tabasco sauce. If my pizza’s got a thin, crispy base and not overloaded with cheese, I’m happy. So, yeah, I’d order pizza again from Kukina. And if you’re just going to Kukina Caferia for a drink whilst you’re shopping or sightseeing in Fethiye, then that’s fine, too. This is probably the time where we ought to be coffee sampling, like we do at Kahve Dünyası in the Erasta shopping centre. However, it’s diet Coke, wine or beer for us…and these great nibbles. Guess where these nibbles come from. Yes, from the stone oven! This is yufka (the same dough used to make dishes like sigara böreği) cut into small pieces and then made into ‘crisps’ in the oven so that you can nibble on them. They’re spiced, too, and, if you like spicy food, you won’t be able to leave them alone. We’ve demolished a good few portions of these things, we can tell you! 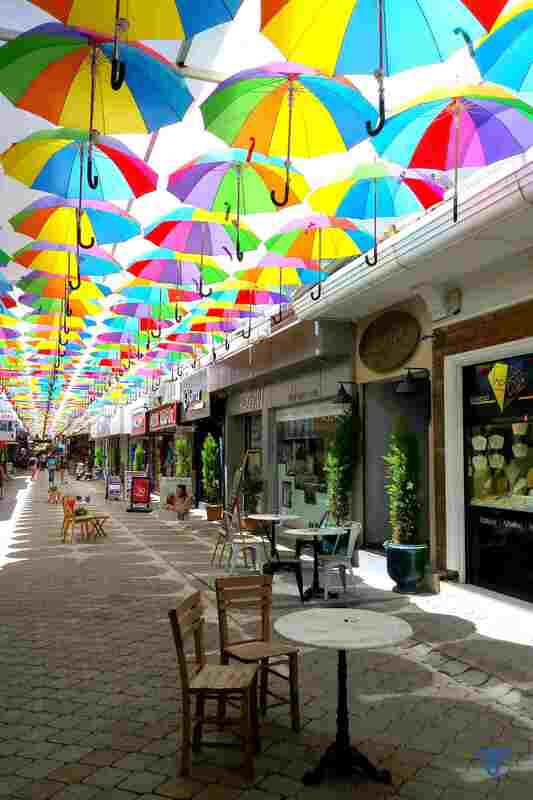 Kukina Caferia is in Çarşı 95 Sokak, where the umbrellas hang. Kukina is open daily until late evening and food is served all day, including breakfast. There is a full bar serving a range of soft drinks, beers, wines and cocktails. There is also a separate coffee bar. If you know Fethiye, Kukina Caferia was previously Cafe Oranje. It is still the same owner and a partner, too. For more photos and keeping up to date with happenings at Kukina, you can follow Kukina Caferia on Instagram. There are sooo many places to eat and drink in the whole Fethiye area. 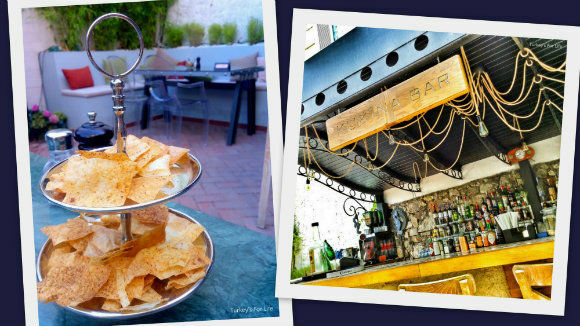 We keep a list of watering holes and eateries that we’ve been to and liked and Kukina Caferia is now a part of that list. Sounds divine! We’ll check it out when we return to harbour!